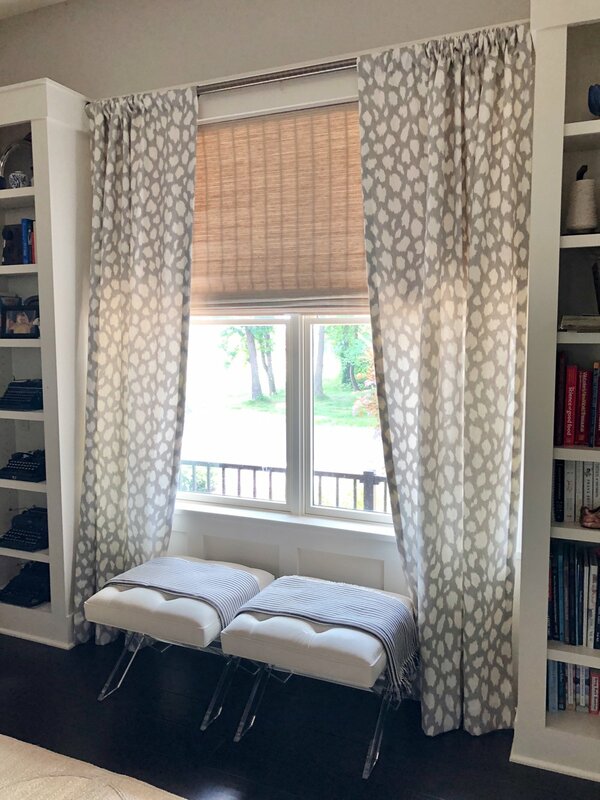 Last month, I shared a post on custom textiles and the beautiful drapes Calico made for my home office. I chose the Kate Spade Leokat fabric in Silver and it added just the right pop of sophisticated pattern to a space that I spend quite a bit of time in. In planning any project, I always come at it from two main perspectives: style and functionality. For me, I can't have one without the other. The new drapes amped up the style factor of my office ten-fold, but they also serve a very important purpose: blocking light from the window behind my desk so that I don't see glare on my computer screen. While I was finishing up details for the drapes, it was brought to my attention that there might be a better, more efficient way to check off the style and functionality boxes. Sure, the drapes served both purposes...but did I really want to open and close them every time I sat down at my computer? Probably not. Enter my Calico In-Home Consultant: "Hey Kristan, have you considered a shade for that window?" Hmmm...layering window treatments? I always admire layered windows when I see them, but I had never attempted to mix and match drapes and shades in my home. Given that a shade can easily be opened/closed with the flick of a wrist, it definitely seemed like an easier option than opening and closing the drapes every time. Okay, I'm sold. Now what? Call in the Experts: "You Don't Know What You Don't Know"
I mentioned my Calico In-Home Consultant earlier. In-Home Consultants are literally a team of Calico experts assembled across the country that are here for you and your project. Once you get in touch with Calico and share more about your project, they can match you with a local In-Home Consultant to plan all the details, refine your options and choose what's right for your home. They're able to work with you via email, photos, FaceTime, the Calico website and C360--Calico's super-cool web tool that allows you to try fabrics on different furniture pieces. It's like having your very own Calico Concierge. My consultant (hi Bobby!) helped me narrow down the type of shade I should go with based on my wants and needs. I'm not an expert when it comes to window coverings...but Bobby is. He walked me through the various types of shades and also shared some great Calico resources, including this Window Treatment Guide. He gave me a lot of things to consider as far as functionality. For example, I wanted to be able to draw my shade up and down quickly since I need it to reduce glare any time I'm working at my computer. So he suggested having one large shade to span both windows, versus two separate shades. So much easier! In-Home Consultants can also guide you when it comes to fabric options. I wanted something with a more organic, textured feel to play off the jute rug I have in my office. Calico's website has an amazing catalog of fabrics to view...and you can search by brand, designer, color or pattern. I took some time to peruse the site and came up with a few of my favorites. I shared that list with Bobby and he added a few more suggestions based on what he knew I was looking for. From there, he arranged to have swatches of all my choices sent right to my front door. This made my final decision so easy! I was able to compare all of my favorites side-by-side. I'm a very visual person, so it always helps for me to see things in the room where they'll “live.” I taped all the swatches up on my office windows to get a better feel for them next to the drapes. I decided to go with a Hunter Douglas shade in "Millhouse Burlap Sack." It's a tan, woven material that offsets the cool leopard-inspired fabric of the drapes beautifully! I chose the "LiteRise" option, which is a cordless shade that you can simply push up or pull down to operate. But did you know that, depending on the type of shade you select, there are a variety of different operating systems you can go with? Everything from standard cordlock to motorized, it truly is a custom shade, right down to how you operate it! I'm a few weeks in with my layered office window and I absolutely love it! Layering window treatments is a great way to add dimension to a room-- you can mix colors and patterns or add a pop of texture. Layering can also help to maximize efficiency in a space where window treatments aren't just for decoration. In my case, the shade allowed me to design the room layout the way I wanted to. I wanted my desk in the middle of the room, in front of my windows. I knew that all the natural light was going to pose a challenge with reflections on my computer screen, but the custom window treatments take care of that and give me an easy way to add style and functionality to a space that now works for me, instead of me working around the space! 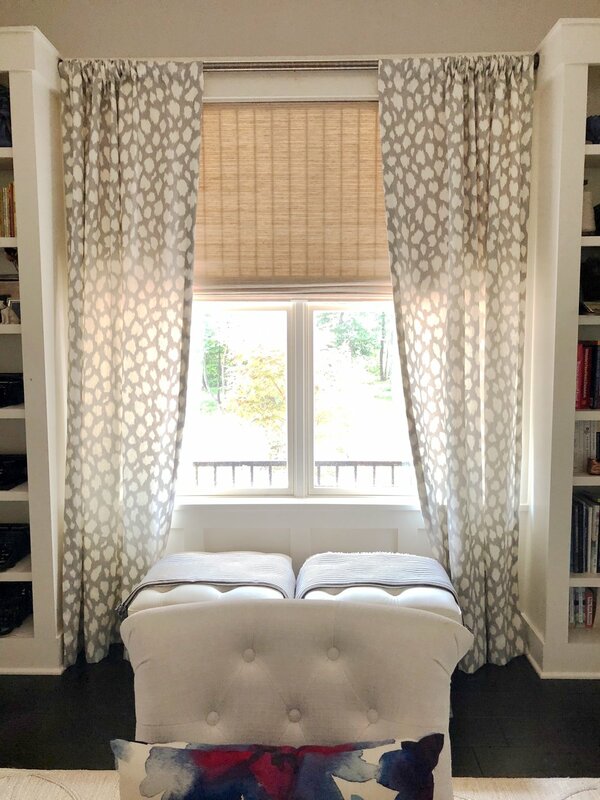 So if you're considering custom window treatments, consider this post my support of your decision...and my recommendation that you look up Calico ASAP! I couldn't have been more pleased or impressed with the ease of planning my project and the amazing outcome. The treatments are made for my specific windows and give them a tailored look that I just couldn't have achieved any other way. Pay a visit to Calico's website to get an idea of all the different custom projects they can help you with...I know you'll be as amazed as I was. Happy Project Planning! Learn more about my search for the perfect window treatments for my master bath and why I’m so glad I went custom! I teamed up with Calico to show how you can use wallpaper to make a big impact in small spaces! 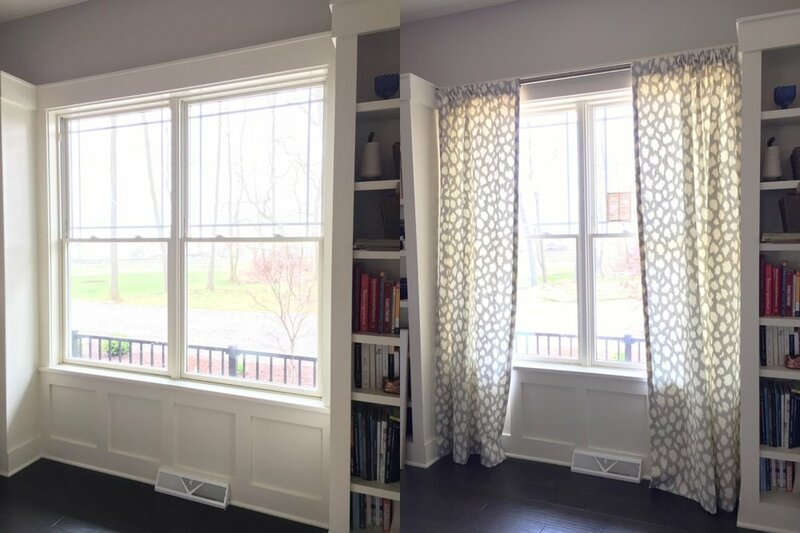 Layering window treatments can be a great way to up the style factor and performance of a room! I just finished planning two custom home textile projects and here’s why I think you should consider this route, too!